In past video projects, RUcore has taken in content that originated in analog formats; usually videotape in S-VHS format that has been digitized to our video preservation standards. A notable example is the Video Mosaic Collaborative. The China Boom Project was very different. This is the first opportunity we’ve had to preserve a video archive that originated on modern, digital video equipment. Recorded in DVCAM format and originating from the start as a high definition video stream, these interviews came to us not on tapes, but on hard drives… two external 750GB USB drives, to be exact. The full-length, unedited video content takes up over 1.2TB of disk space. Screenshot of China Boom files in Final Cut Pro. A session is being exported for inclusion into RUcore. 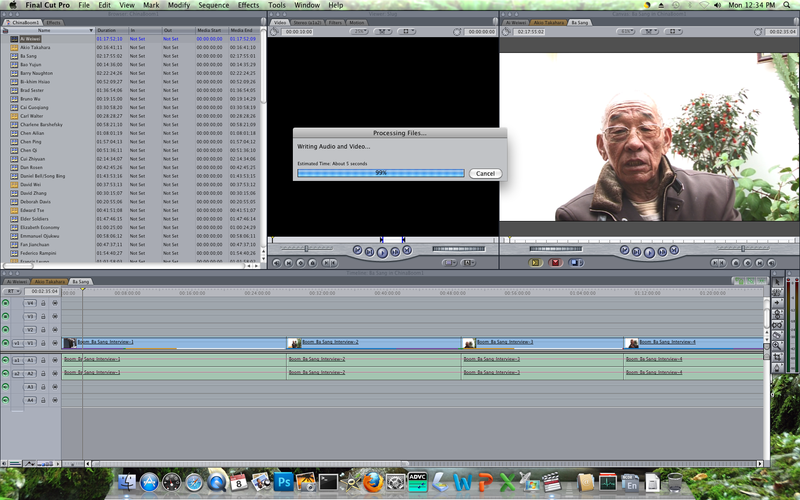 The source video was imported at the Asia Society into a Mac, using Final Cut Pro 7. This necessitated that a Mac be used to work with the master files and export video content. Fortunately, the Digital Curation Research Center at the Scholarly Communication Center was already well-equipped with the hardware and software needed to handle this task. The China Boom source video files of each of the interviews were all combined into a set of two Final Cut Pro projects. In order to facilitate their ingestion in to the repository, each full length, unedited interview was split into its own FCP7 project, and exported along with a completed full-resolution 1080p60 rendered Movie file. The Final Cut Pro 7 project file (.fcp) that describes how each video clip is integrated into the project, including the Final Cut Pro XML files. A rendered full-resolution, native DVCAM video file as composed in the project. This approach is important, because of recent developments with how Apple is developing Final Cut Pro. These videos were created before the current version of the software, and at present this version is not backward compatible with Final Cut Pro 7. Apple’s current hardware and operating systems continue to support FCP7, but how this will progress years down the line is anyone’s guess. As a result, the rendered native video file is included to help “future proof” the archival master, since a wide variety of video playback and editing software (including open source alternatives) can play back, the file format. Additionally, other major editing programs can access the XML files to import the project data. An H.264 MP4 baseline file that will be used for progressive download, streaming and mobile device access in future versions of RUcore. All of these presentation files were rendered in 768kbps 480p resolution, at 30 frames per second, to facilitate easy access by users with a minimum 1Mbps internet connection. At present, we’ve just begun to encode the entire collection, with the first 9 videos being made available as of this writing. We hope to complete all 100 interviews before the end of the fall semester, making all of them available through the China Boom portal. And what you see at the site currently is just a first step. In the near term, a release of RUcore will include an analytic tool that will permit researchers to annotate and analyze video objects in this and other repository collections, opening a window to the China Boom content that could enhance its usefulness for years to come. 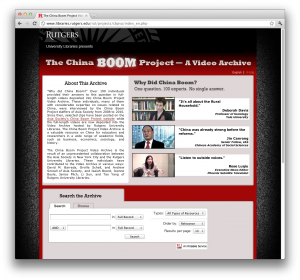 The China Boom repository portal is available at this link. In addition to the transcoding effort at here at the DCRC, quite a few individuals were involved in making this portal possible, including the web design team at Rutgers University Libraries (Kalavani Ananthan, Martha Barnett, Mary Ann Koruth, Sam McDonald); Library faculty and staff involved in collection management, cataloging and rights (Jeanne Boyle, Janice Pilch, Li Sun, and Tao Yang); and David M. Barreda, Orville Schell, and Andrew Smeall at Asia Society.